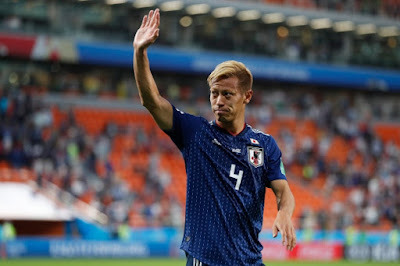 Keisuke Honda and the countries captain Makoto Hasebe announced their retirement from international football after Japan's defeat against Belgium. Honda who is 32 years old announced after the Belgium match it was to be his last for Japan. As he explained he will not be playing at the Qatar World Cup in 2022. While Makoto Hasebe announced his retirement also at the age of 34. At the end of the game against Belgium, you could see Honda was visibly upset as he stood with his hands on his waist with tears dripping down his face. Anyone who then watched Honda shaking hands with the Japan players and staff could have guessed this would be his last time in a Japan shirt. The midfielder formally of AC Milan seemed confident for the future as he said "Today we showed how we can proceed as Japanese football, I might have finished my career for the national team, but I'm happy because we have many young players following us, and I think that they will make new history for Japanese football." If any of these young players coming through go on to have the career Honda had they will be doing something right and the national side would be very lucky to have them. Honda leaves the Japan set up as one of the best players in the countries history. He will also go down in history as the only man to score at three World Cups for Japan. Along with Honda, his teammate Hasebe retired, another player who will be lovingly remembered by the Japan fans. To show the level the defender got to the former Japan coach Alberto Zaccheroni once said he's only ever worked with two true captains with one being Makoto Hasebe and the other being none other than Paolo Maldini. The player announced his retirement on his Instagram page as he said "I would like to express my gratitude to my colleagues who fought together for about 12 and a half years since 2006, and to all the Japanese people who supported me so much. The time I walked with you is an important treasure for me. Thank you from the bottom of my heart!". Both players it is clear will be sorely missed but it is anticipated the new generation will come through and improve the side.